Player characters weren’t always adventurers. Before they decided to head off into dark mysterious dungeons or ogre-infested wild lands, they most likely started down one or more ‘respectable’ career paths. In most ‘old school’ fantasy role-playing games like OSRIC, however, this aspect of a character’s early life has no effect on that character’s abilities. This optional rule aims to rectify this situation. Moreover, by providing all characters with at least one ‘background profession,’ this optional rule should provide greater depth and personality to the players’ characters. Consider, for instance, the following party. Cormac the fighter was once a hunter who was raised near the Highland Forest, hence his skill in tracking prey and moving stealthily in hill and wood. In contrast, his ally Elowyn, also a fighter, was once a scholar in the city of Bookbridge, hence her wide-ranging knowledge of different subjects. Elowyn’s wide-ranging lore intimidates her companion, the magic-user Alaric, whose own background as a petty noble in the court of the Duke of Briz means that he knows much of current politics and fashion, but little of ancient eldritch secrets, despite his arcane training. Finally, their holy ally – the rotund Fredigar, priest of Muirgen, Mistress of the Sea – spent years as a merchant and sailor before being called to service by his goddess. With this optional rule all characters may start with at least one ‘background profession.’ Players may roll either once on chart I, or twice on chart II below (the background professions on chart I are slightly more useful for adventuring characters). While GMs may permit players to re-roll results that do not seem to match their conceptions of their characters, players are encouraged to try to make counter-intuitive rolls work for their characters. For example, it may be that a paladin once was a pickpocket, before being ‘saved’ from a life of crime by his church. It is assumed that characters abandoned their professions in order to become adventurers before progressing beyond the ‘apprentice’ stage (or equivalent). Thus a character who has the background profession of ‘alchemist,’ for example, would not be as skilled at alchemy as most professional (non-player character) alchemists. A character’s background profession(s) can enable that character to do or know certain things that other characters cannot do or know. For example, a frontiersman may know whether a kind of wild berry is poisonous or not, or a doctor may know how to treat a particular infection. A character’s background profession(s) also can give that character a bonus (typically equivalent to +4 on a d20, or +20% when using other dice) when attempting certain kinds of tasks. If a character has two professions, any bonuses from those professions are not cumulative (so a character with both the ‘fisher’ and ‘sailor’ background professions, for instance, would not gain a +8 (+40%) bonus to his/her attempts to swim in troubled waters, but only a +4 (+20%) bonus). Ultimately, of course, it is the Game Master’s decision whether or not a character’s background profession confers any special advantage in any particular situation. Similarly, it is up to the GM to determine whether a particular background profession is available to a character. The GM may decide to prohibit certain races from having certain background professions (for instance, the GM may decide that dwarf characters cannot have the frontiersman, hunter, or sailor background professions), or may restrict background professions to human characters (and perhaps half-elf characters raised in human societies) only. Players may roll either once on chart I or roll twice on chart II (re-rolling any identical results). Characters with the alchemist background profession start with 1+1d3 potions (to be determined randomly or by the GM). Aristocrats have knowledge of court etiquette, heraldry, recent history, and politics. They are skilled at difficult riding manoeuvres (+4/20% bonus) and mounted combat (+1 bonus to hit when on a trained warhorse). Characters of an aristocratic background start the game with an inherited high-quality weapon or shield. Because of its superior quality, this item will have a +1 non-magical bonus (i.e., the weapon will have a +1 bonus to hit but not damage, or the shield will grant a +1 bonus to AC). Characters will not part willingly with this item (i.e., will refuse to sell it, even if in dire straits). Aristocratic characters also start with a bonus of 2d20 gold pieces. Blacksmiths can repair metal weapons and armour with proper equipment (costs 10% of ‘market’ weapon/armour price for supplies and to rent forge; normally takes one day per item). Blacksmiths can also determine the correct value of non-magical weapons and armour within 10%. Characters who once spent time as brigands are skilled at hiding and moving silently. Non-thief characters with this background may hide in shadows and move silently as a first-level thief, but may never improve beyond this level of ability, unless they are assassins, in which case they improve normally after level 3. Thief characters with this background profession receive a +15% to their hide in shadows and move silently abilities, and start with a suit of leather armour and sling at no cost. Doctors can bandage wounded characters with proper equipment. A doctor can heal 1-2 hit points after one turn of applying a bandage or a salve. Alternatively, a doctor can treat an unconscious character, returning that character to consciousness after applying a bandage or salve and using smelling salts for one turn (the awakened character will have one hit point). Doctors can heal a character in this way only once per combat. Characters who were once farmers are skilled at predicting weather (roll of 6+ on d20) and at bartering (+4/20% bonus). If near a body of water and properly supplied (with a net, etc. ), former fishers can capture enough fish to feed a 3+1d4 people for a day. Fishers are also skilled at swimming (+4/20% bonus if roll required, e.g., if the character is burdened, or is swimming in rapids; otherwise simply assume success). Characters who were once fletchers/bowyers can make 1d4+1 scores (i.e., 40-100) of arrows or bolts per day with proper equipment (costs 10% of normal price). Such characters also are skilled at repairing damaged arrows and bows (roll of 6+ on d20 for every 5 arrows). Fletchers/bowyers can determine the correct value of non-magical bows within 10%. There is a 2% chance/week (non-cumulative) of gambling during which the character makes 60+ silver pieces that 2-5 (1d4+1) thugs will be sent by a disgruntled loser in order to recover the ‘unfairly taken’ funds from the character. Characters who were once hunters have good knowledge of regional wildlife (+4 /20% bonus if roll is required). They are skilled at tracking creatures (any land-based animal, humanoid, or monster) in the wilds (base 20% chance; add to tracking % if character is a ranger), and are good at hiding and moving silently in the outdoors. Non-thief characters may hide in shadows and move silently as first-level thieves. However, they may use this ability only outdoors, and it never improves with experience, unless the character is an assassin (in which case it improves normally after level 3). Thief characters enjoy a +15% bonus to their ability to hide in shadows and move silently, but only outdoors. Characters who were once leatherworkers can repair any leather good, including leather armour, with proper supplies (costs 10% of normal price; normally takes half a day per good). Leatherworkers also can determine the correct value of non-magical leather goods and hides within 10%. Locksmiths are skilled at repairing and disabling most mechanical devices, such as locks, mechanical traps, etc. Non-thief characters may pick locks and disarm (mechanical) traps as first-level thieves. This ability, however, does not improve with experience (unless the character is an assassin, in which case it improves as normal for that class). Thief characters that were once locksmiths enjoy a +15% bonus to their ability to pick locks and disarm traps. Masons receive a bonus (+4/20%) to notice unusual stonework (including stone traps, sloping passageways, etc.). They also receive a bonus to detect secret or concealed doors constructed of stone or surrounded by stone. Add +1 to the character’s d6 ability to detect secret and concealed doors, if stone or part of surrounding stonework. Also assume that most characters have a base 10% ability to detect unusual stonework, to which the above modifiers apply (thus 30% for human ex-masons), unless they are dwarves or gnomes, in which case apply the +20% bonus to the percentages listed under the descriptions of their special racial abilities. Merchants are knowledgeable of the regional economy and current politics, and are good at bartering (+4/20% bonus if roll required). Characters with the merchant background profession start the game with extra ‘supplies’ (player’s choice of kind of goods) worth (2+1d4) x 20 (i.e., 60-120) gold pieces. Characters who were once minstrels are knowledgeable of regional culture, court etiquette, and current politics. They know how to play one instrument (player’s choice), and own that instrument (decent quality – worth 20+2d20 gold pieces). Minstrels can earn 2d12 silver pieces per week from performing (the character cannot adventure during this time) in any decent-sized town (population 1000+). Minstrels can only earn 1d12 silver pieces per week in smaller locales. Characters who are not thieves, but who once spent time as pickpockets (perhaps as street urchins or as aspiring thieves before opting for a different career), can pick pockets as first level thieves. This ability does not improve as the character gains experience in his/her non-thief class (unless the character is an assassin, in which case this ability improves as normal after level 3). If the character is a thief, then he/she gains a +20% bonus to his/her ‘pick pockets’ ability, and an extra 10-60 (1d6x10) starting gold pieces. Former sailors are skilled at predicting weather (+4/20% bonus) and swimming (+4/20% bonus if roll required, otherwise assume automatic success). Characters who devoted their pre-adventuring years to study are knowledgeable of a wide range of general topics, such as those concerning culture, geography, history, religion, etc. (assume a base 50% chance that the character will be able to answer any ‘general knowledge’ question; reduce to 1-20%, according to the GM’s judgement, for more specific and/or difficult questions). The character abandoned the pursuit of academic knowledge before becoming a proper sage, and thus lacks any specialised areas of knowledge. Scholars also are knowledgeable of certain legends, including those concerning powerful monsters, ancient heroes and villains, powerful relics and magic items, etc. (+4/20% bonus). Scholars can try to identify a magic item (15% chance of success; +2% for every point of Intelligence above 12) if appropriate libraries and/or colleges are available (typically requires a town with a population of 5000 or greater; takes one week of research per item, and costs 50+1d20 gold pieces). Characters who were once sentinels or guards are trained to be observant (+4/20% bonus to rolls to notice unusual things). They start with a suit of chainmail, rigid leather, or leather armour (player’s choice), a small shield, and a one-handed weapon (player’s choice) at no cost. A character’s probability of success when using the abilities associated with his/her background profession in many cases has been noted above. In some descriptions of background professions, though, only a bonus (typically +4 on a d20, or the equivalent of +20%) has been identified. It is left to the GM’s judgement to adjudicate how to apply this bonus in particular cases (e.g., a +2 to a roll on a d10). However, a proposed method is provided here. One way to resolve various tasks, which has a long history in ‘old school’ fantasy role-playing games similar to OSRIC, is to make an ‘attribute check.’ This involves rolling a d20 and ‘checking’ the roll against the appropriate attribute or ability score (viz., strength, intelligence, wisdom, dexterity, constitution, or charisma). If the roll is equal to or less than the character’s relevant attribute (which typically will range from 3 to 18), the attempt is successful. Under this system, any bonus that applies to the relevant task from that character’s background profession is added to his/her relevant attribute before making the roll. However, a natural roll of a ‘20’ is always considered a failure (unless the GM judges otherwise – the GM may decide that, in particular situations, if a character has an attribute equivalent to 20+ that character automatically succeeds at the task in question). For example, a character with the ‘fisher’ background profession attempts to swim across a turbulent river. If the river had been calm, the character would have succeeded automatically. Because of the rough water, though, the GM requests that the character make an attribute check against her strength. The character has a12 strength, but because of her fisher background, that is adjusted to 16. Thus the player must roll a 16 or lower on a d20 in order for her character to swim successfully across the river. Finally, whenever a character must roll to use an ability associated with his/her background profession, it is recommended that the GM apply modifiers if appropriate. Very easy (but not automatically successful) tasks might receive a bonus of +10, while extremely difficult (but not impossible) tasks might receive a penalty of -10. Less extreme modifiers should apply to rolls involving tasks of intermediate ease or difficulty. When using the ‘attribute check’ system, these modifiers should be applied the character’s ‘effective’ attribute for the purposes of the roll. So, for instance, if the ‘fisher’ character mentioned earlier were to try to swim across a turbulent river while wearing a heavy backpack, the GM may assign a penalty of -6, rendering her effective attribute ’10’ (12 strength + 4 bonus for background profession - 6 for backpack = 10). An earlier version of this article, written for the Swords & Wizardry game, was posted four years ago (!) here. A slightly different version of that earlier version was published in Fight On! issue # 5. In addition to modifying that earlier article for OSRIC and Advanced Dungeons and Dragons (1e), I made a number of other minor additions and changes (e.g., the 'pickpocket' background is new, as is the chance that some thugs might be sent to 'rough up' a successful gambler). An obvious inspiration for this article is the 'Secondary Skills' chart in the 1e Dungeon Masters Guide (p. 12). 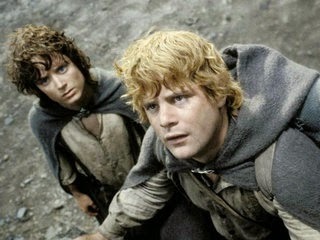 CHICAGO — You don't need hairy Hobbit feet or a fluency in Elvish to travel to Middle Earth — at least in this "reality." A new reality TV show called "The Quest," described as "if 'Amazing Race' took place in Middle Earth," will host a "meet and greet" for potential cast members Thursday in Chicago. Sci-fi fans with a thirst for adventure can attend the event with casting director Kristin Malley from 8 to 10 p.m. Thursday at Emporium Arcade Bar, 1366 N. Milwaukee Ave.
"The Quest" comes from the creators of "The Amazing Race" and one of the executive producers of "The Lord of the Rings," film trilogy, Malley said. An ideal contestant would be "competitive, [with a] good personality, high energy, who also has a flair for the fantasy and sci-fi world," Malley said. Well, I do have hairy Hobbit feet and fluency in Elvish (both Sindarin and Quenya*). But I have no idea what "The Amazing Race" is, am not "competitive", and most decidedly am not "high energy". 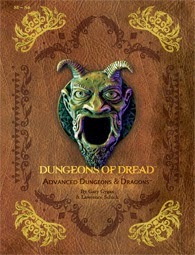 I recently picked up Dungeons of Dread, the reprint of the AD&D modules S1-4. It’s a very nice book, like the other AD&D reprints that WotC has put out recently, although the internal art is all black and white, so the beautiful colour Erol Otus pictures from S3 are all rendered greyish. Anyhow, with the release of Dungeons of Dread, WotC also has posted these comic ‘maps’ of the Tomb of Horrors and White Plume Mountain. They’re well worth checking out! Ian M. Banks has been diagnosed with terminal cancer. Banks, as I assume many readers already know, is one of the leading science-fiction authors of our generation. He is the creator of the 'Culture' universe. He also wrote a wide variety of non-SF novels, and a non-fiction book on whisky (Raw Spirits). Banks's Culture novels helped to make life bearable for me during the 1990s. His novels Use of Weapons and Player of Games especially stand out: I remember being amazed, thrilled, and horrified by both of them. Indeed, most of Banks' novels left a strong impression on me, even his lesser known ones (e.g., The Bridge, Inversions). This is very sad news. The SF community will be poorer with his passing.